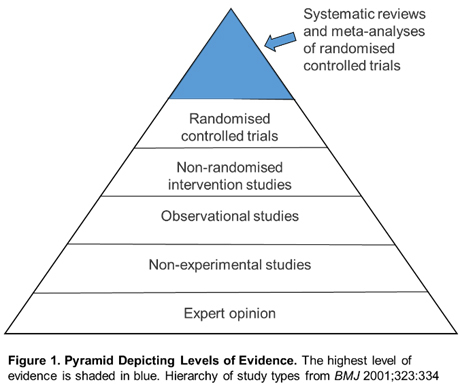 When I first learned about the principles of evidence-based medicine in medical school, a key lesson involved the evidence pyramid (Figure 1). The pyramid depicts the hierarchy of evidence. Atop this pyramid sits the meta-analysis of randomised controlled trials, considered the “gold standard” for evidence regarding the effects of a therapy. In neonatal medicine, the Cochrane review is a trusted source for meta-analyses that summarize available medical knowledge. Many clinicians and organizations use the Cochrane review to inform and guide safe and effective care. So, in 2011 the Cochrane review by AlFaleh et al. of probiotics to prevent NEC grabbed my attention based on the conclusion: “Enteral supplementation of probiotics prevents severe NEC and all cause mortality in preterm infants. 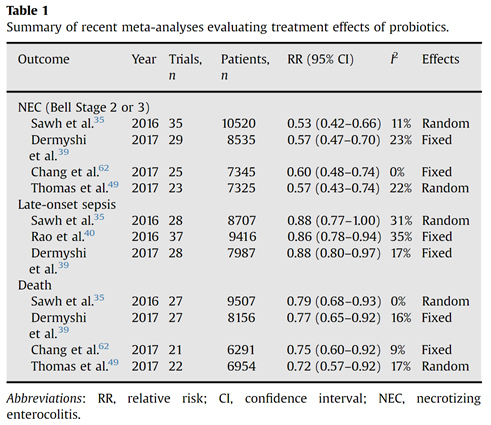 Our updated review of available evidence supports a change in practice.” Here was the “gold standard” evidence in our field recommending the use of probiotics to prevent NEC. A few years later, in 2014, the recommendation in the conclusion was updated to: “Our updated review of available evidence strongly supports a change in practice.” In that review, 24 randomized trials enrolling 5112 infants had studied the effects of probiotics on NEC. 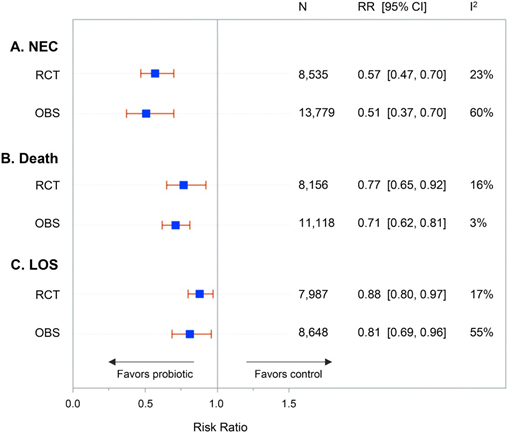 The evidence demonstrated that probiotics could reduce the risk of NEC by over half (relative risk 0.43; 95% CI 0.33-0.56). The authors also found a 35% reduction in all-cause mortality (relative risk 0.65; 95% CI 0.52-0.81). There are no other therapies we provide to infants, aside from human milk, that have such a strong effect on decreasing the risk of NEC. Since these earlier publications, a number of more recent meta-analyses have shown similar results (Table 1). By my last count earlier this year, the number of probiotic trials in preterm infants had grown to 46 with enrollment of over 12,000 preterm infants. 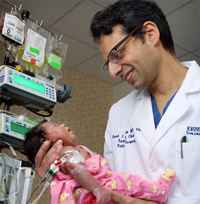 In the US, where I practice, very few NICUs in 2014, including our own, were using probiotics. Here was high-level evidence, based on the pyramid, that was not being translated to practice. We’ve seen this before. In 1972, Liggins et al. conducted the first trial of antenatal steroids administered to a mother to improve survival for her preterm infant – it took at least two decades for this therapy to be routinely provided to mothers at risk of extremely preterm delivery following an NIH conference in 1994. This translational gap, noted to be 17 years by researchers, suggest many treatments take over a decade to move from clinical studies to routine practice. 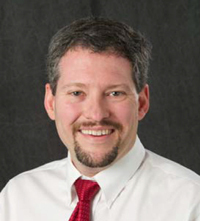 Some clinicians and centers may adopt therapies earlier than others, based on how they interpret and integrate clinical expertise with the best available external clinical evidence from systematic research, espousing principles first laid forward by Sackett. Over five years ago, we embarked on a quality improvement effort to decrease the rates of NEC at our center. We began discussing in detail the data on the use of probiotics and asked ourselves several key questions: 1) Did the benefits of probiotics clearly outweigh the risks to support routine use? 2) Were the effects of probiotics demonstrated in controlled trials seen when centers routinely began supplementing infants? 3) Was there data on the effects of different types of probiotic products? 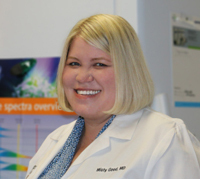 At the time, there were divergent opinions in the field for and against the routine use of probiotics, coupled with promising experience from centers using probiotics routinely and the omnipresent worry about NEC in our most immature infants. After much discussion within a multidisciplinary team over an extended period, we decided to begin routine supplementation with the probiotic Lactobacillus rhamnosus GG. We chose the product because it was on our hospital formulary (it is the most common probiotic available in US academic centers). This product was later reported to be the most common product supplemented to preterm infants in US NICUs. We published our experience earlier this year. After over two years of routine use of probiotics, we did not see any decline in our NEC rates. I’ve been wondering why? As with all therapies, translation of an effect seen in a controlled clinical trial (a measure of efficacy) to routine practice (a measure of effectiveness) depends on many factors than just the therapy itself. These can include: How adherent are patients? 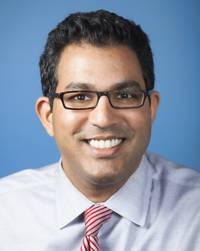 Did routine use differ from methods described in clinical trials? Was the population similar or different? Was there co-treatments that influenced the treatment effect? Was the specific product or strain not effective for our population? Did changes in our population over time account for changes in the NEC rates that were unrelated to probiotic supplementation? These are important questions to ask and raise potential implications for probiotic use by other centers and the need for additional studies. Other centers have had different experiences than ours. In a summary of routine use that we recently performed, the treatment effects (i.e. benefit in reducing NEC) with routine clinical use by individual centers as well as multi-center collaboratives, were similar to those seen in trials (Figure 2). However, there was a high amount of heterogeneity (I2), which means substantial variation in the findings among studies. I believe there is an opportunity to understand what may explain this variability. Is it the product or strain chosen, other treatments given, how infants are fed, or co-treatments such as antibiotics? As an epidemiologist, I was taught that heterogeneity (or interaction) is important to consider and evaluate – to understand how two or more different treatments or exposures may influence one another. 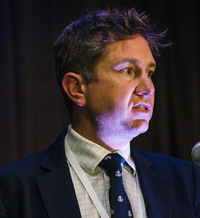 This is an understudied area with many therapies, including probiotics, and one that could help improve our understanding of the effects of probiotic supplementation in routine practice. As a center considering whether or not to use probiotics, a first question to be asked is whether sufficient effort has been applied to improve breastfeeding, which is a safe and effective approach to prevent NEC. It is critical that centers invest substantial effort to ensure infants are fed breastmilk. After reviewing the evidence and uncertainty around probiotic use, clinicians may use their own experience and expertise to decide if the available evidence is sufficient or not for routine clinical use (Table 2), applying the principles Sackett described decades ago. Pre-clinical and human data supports biologic plausibility. No regulator-approved drug (live biotherapeutic product) formulation. Numerous RCTs enrolling >10,000 infants show consistent benefit (low heterogeneity) in decreasing the risk of NEC. Concerns regarding product quality and contamination. Large magnitude of effect on NEC in meta-analysis (decreases relative risk by approximately one-half), as well as potential benefits in reducing the risk of sepsis and all-cause mortality Well conducted, multicenter trial (PiPS) showed no benefit on NEC (of note, relatively high rate of cross-colonization with probiotic strain in control arm). Multiple implementation cohort studies support effectiveness of probiotic supplementation in routine practice. Uncertainty regarding optimal product/strain, including dose and duration of supplementation. Meta-analysis for subgroup of infants with birth weight <1000 g infants show no increased risks of sepsis. Limited studies with long-term follow-up data (although one large trial shows no evidence of harm and lower risk of deafness). Low relative cost of supplementation. High number needed to treat for centers with low incidence. 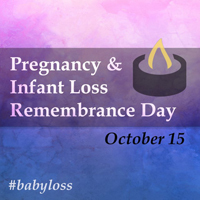 NEC remains a major cause of death in preterm infants. Other opportunities (e.g. increasing human milk feeding) to decrease the risk of NEC. For those clinicians and centers that believe the data is sufficient to support routine supplementation, they may benefit from the experience of other centers and collaboratives. A center’s baseline NEC incidence should also be an important factor to consider, as it informs the number of infants that would need to be supplemented with probiotics, on average, to prevent one case of NEC (Table 3). However, it is also important to remember that for an individual infant and parent, NEC either occurs or is prevented. Clinicians may decide the data are not sufficient and wait for the potential to have a drug formulation of a probiotic in the future; or clinicians may decide to address other improvement opportunities to prevent NEC. Parents should also have a voice, as one survey suggests most support the use of probiotics. One recent international survey noted only 21% of parents were aware of the potential risks and benefits of probiotics for NEC. Another survey suggests that although awareness of probiotics is high, there is uncertainty by mothers about their benefits. Organizations such as SIGNEC, The NEC Society and Instituto PGG are providing important venues to engage families. In the end, the “right” decision regarding probiotic use is one that integrates the best available clinical evidence with the experience and expertise of clinicians, considering parental preferences and the local context of care. 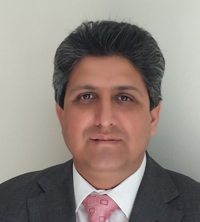 To follow Dr Patel on Twitter, click on the icon below.